Rivers like the Pere Marquette, as well as the Big and Little Manistee, get a little crowded after Labor Day as thousands of salmon leave Lake Michigan to push up these steams to spawn. 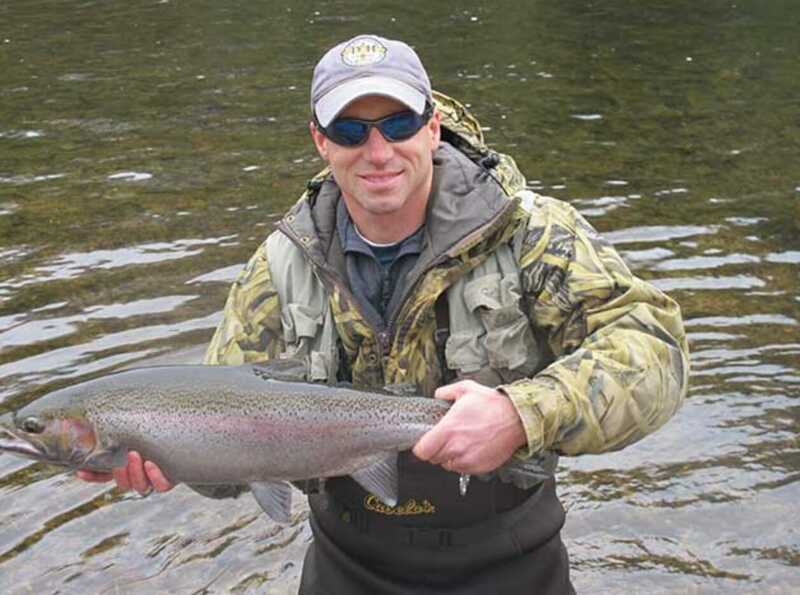 F rom late August until September king and coho salmon dominate the scene. Wading anglers and those fishing from boats will get their tackle tested by king salmon weighing as much as twenty pounds. In the first part of September salmon bite more readily, but the longer they stay in the river, the less likely they are to feed. As the leaves begin to color for autumn, steelhead and browns join their Lake Michigan bred cousins in the upriver migration. By mid-October as the kings and cohos start to die off, the trout anglers start to score. While the occasional lake run brown trout is caught, most of the fresh fish coming upstream are steelhead. To get a big run of steelhead, it has to rain. Stormy weather adds warmer water to the streams and this runoff is what brings the steelhead into the rivers. 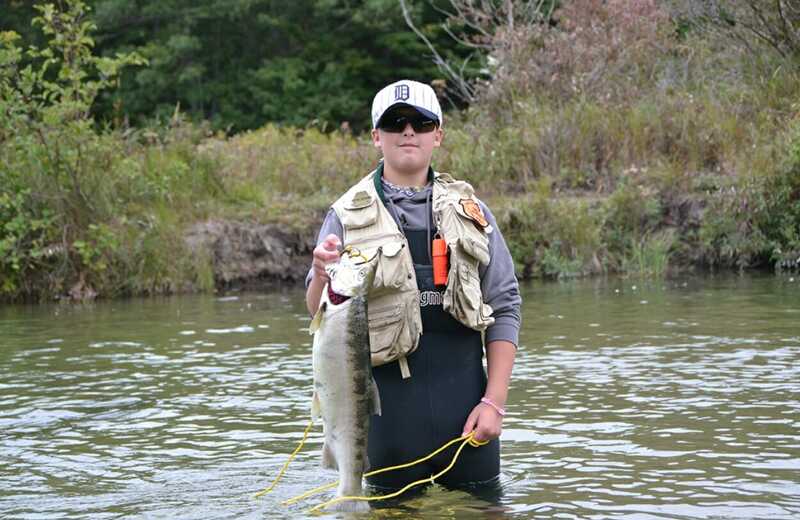 The greatest number of fish and fishermen will be found at Tippy Dam on the Manistee River and along Suicide Bend and at the Sawdust Hole, two popular sections a short distance below the dam. Although the stream bottom is littered with snags, the river here is wide enough that fish can be played out and there is less likelihood of being broken off. Farther downriver, it gets hard to wade. In the bigger sections of river most fishing is done from boats. Wherever you’re fishing, getting a fall steelhead to the net is not easy. Long searing runs downriver and spectacular leaps will test both the angler’s tackle and his skills at playing fish. I’m lucky if I can bring half of what I hook to the net. 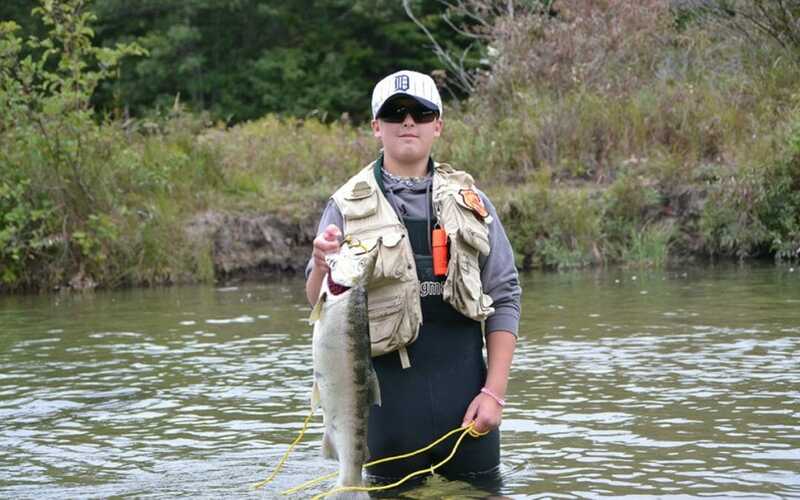 When fishing the smaller snag-laden Little Manistee River, unless you’re using heavier tackle, ten or twelve pound test monofilament, you can expect to lose most steelhead that take the bait. At least that’s been true for me. I find the wider, more open, Pere Marquette to be a friendlier river when it comes to landing fish. It pays to be persistent when fishing for steelhead. While the first drift through a run might provoke a strike, it’s just as likely that it may take repeated casts to get some action. For natural bait it is hard to beat spawn. Drifting tied spawn bags through runs or fishing them below bobbers can be productive since trout actively feed on salmon eggs. Hooking a wax worm on a jig or tipping a fly with an egg are other productive rigs for taking steelhead. These lake run rainbows are wary so best success comes to those using six to eight pound monofilment. A limber rod, about nine feet long, helps minimize the chances of losing the battle with a steelhead. Anglers using spinners or plugs likeThundersticks, Hot N Tots, Reef Runners, and Rapalas can use heavier lines, in the range of ten to twelve pound test, as these lures are designed to profvoke strikes and don’t get the scrutiny that natural bait does. Fly fishing is becoming more popular. Stripping streamers or flicking wet flies into the deep pockets or runs can be a productive way to attract trout. Fly anglers looking to get away from the bait casters and lure tossers may want to head toward Baldwin and try the Pere Marquette. It’s flies only on the stretch from M37 to Gleason’s Landing.  To increase the chances of success, call the DNR Fisheries biologist or stop in at the Pilgrim Village Fishing Shop to learn current information on where the fish are and what baits are taking steelhead. This time of year the fish are on the move and their location and bait preferences sometimes seem to change every week. Dave Foley is an outdoor enthusiast who takes every opportunity to be out on the trails, roads, and waterways of the area.